Cascade offers a wide array of services to our Members including all-in-one Employment Law posters. There were several poster updates this year at both the State and Federal level so it’s a good idea to get rid of your old posters and start fresh. We offer both heavy duty glossy and laminated depending on your needs. Keep in mind that the Oregon Minimum Wage will increase in July. As an added benefit to ordering from Cascade we will send you an easy-to-apply sticker to reflect the change at that time. 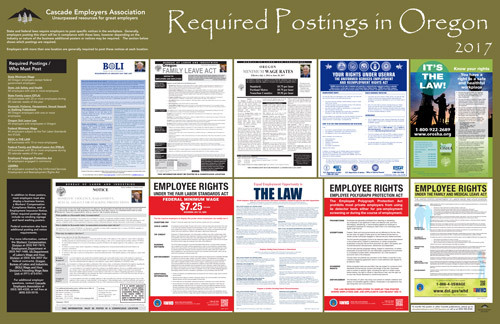 This is an easy way to get in compliance with your employment law posters. If you use all-in-one commonly required posters, go to our website and order yours. We won’t invoice you until your order ships. Next post: Leadership & Self-Fulfilling Prophecies: Are You Selling Your People Short?